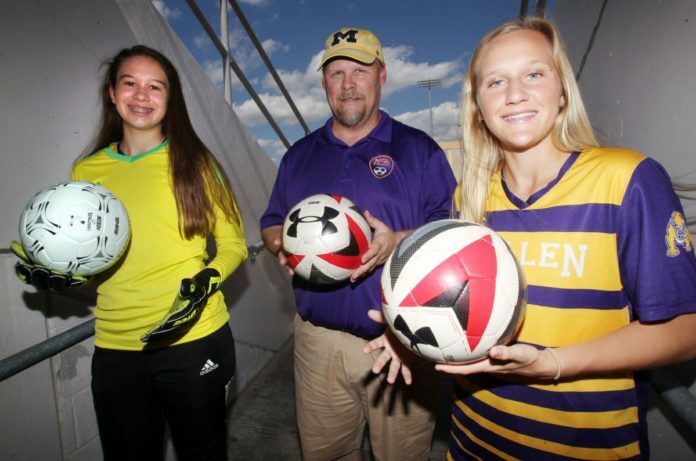 McHi's Lexi Gonzalez, coach Patrick Arney and Westyn Henderson pose for a photo at McAllen Veterans Memorial Stadium Monday, May 28, 2018. McALLEN — The wait between the winning goal and final whistle was only 2 minutes and 13 seconds, but even that felt long for the coach who had been working 22 seasons to help his Bulldogs climb this mountain. After a 2-1 upset win over San Antonio Johnson in the regional semifinals and an even more surprising 1-0 victory against AustinLakeTravis, McAllen High became the first RGV girls team to reach the state tournament. In the coming days, McHi coach Pat Arney received messages from former players of the past two decades, all bricks in a long path to an improbable goal. The distinction as the area’s best coach isn’t new to Arney, but this season that led to The Monitor’s All-Area Coach of the Year superlative was uncharted territory. The state tournament in Georgetown is always the goal for an elite team, but the veteran Bulldogs coach knew how steep the uphill battle would be to reach the final four. Arney knew the road was going to be tough in November, when the team met for practice for the first time. He knew he had to replace last season’s Monitor All-Area Player of the Year in Anna Hover, and he still carried memories of a tough loss in the 2017 regional tournament. Most notably, his new group was composed mostly of sophomores and other underclassmen, even in crucial roles. Youth would be the theme and the anchor of the 2018 team. Westyn Henderson, this season’s Player of the Year, and Lexi Gonzalez, this season’s Defensive Player of the Year, were only sophomores. Both ended up on the state all-tournament squad. Gonzalez, who played goalie, said the process of jelling into a squad was initially tough. Sophomores Ava Alaniz, Mireya Ramirez and Sofia Soto made major impacts. So did older players such as juniors Hannah Kelly and Zoe Flores, plus a small senior leadership core of Victora Sola and Jackelyn Lemus. The Bulldogs didn’t lose a district game the entire season and scored double-digit goals in some of those victories. Arney said lopsided wins turned out to be a major benefit, because he was able to give minutes to a larger portion of his roster. Those players were needed en masse during the humidity of the regional tournament’s day games. Arney commended the area teams that put up such a strong fight during the postseason. Wins against Harlingen South and Harlingen High were by one and two goals, respectively. Arney said the Valley will have to produce a large group of strong teams in order for an RGV squad to return to the final four. “If we’re ever going to get back, we need more competition and more teams that are going to push us,” Arney said.